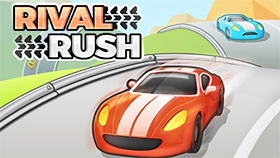 Welcome to Uphill Rush Slide Jump, an exciting distance video game that has the racing element. The game takes place in the summer at a large water park with giant sliding pipes. You will slide down these slide pipes with a float to enjoy the coolness in the hot summer. Your mission is to move as far as you can to get the highest score. 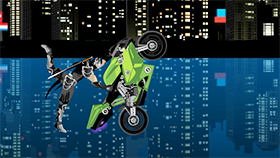 Uphill Rush Slide Jump has many levels with increasing difficulty. In each level, you can collect diamonds to buy new skins. In addition, you can unlock new skins by completing achievements in the game. At the sliding pipes you have to overcome obstacles (they will slow you down). Once you reach a big slope, you will fly high and land on the ground to finish your turn. An interesting feature in Uphill Rush Slide Jump is "touch to accelerate". On the game screen there will be a circle. You must touch the screen when the needle moves in the yellow area of the circle to accelerate. After each time you successfully accelerate, the yellow area will be smaller. At the top of the game screen are your money and the mini-map. With fun music, colorful graphics, and simple gameplay, this game will give you comfortable moments. Good luck and have fun! You use mouse to control your vehicle in this game. You must touch the screen when the needle moves in the yellow area of the circle to accelerate. Collect as many diamonds as you can! Do you want to play Uphill Rush Slide Jump Unblocked for free? If so, Freegames66.com is the right place for you. Here, you can play Uphill Rush Slide Jump Unblocked comfortably with a cool interface. Also, we always have the list of the best unblocked games, all for free. Enjoy your time!